Over the past half century, our increasing ability to manage acute illnesses such as infections and chronic diseases such as cancer and diabetes has contributed to the dramatic increases in the human lifespan. In fact, adults aged 65 and older make up 8.5% of the global population.1 As this segment of the population continues to grow, it will require increasing support. There has been a growing emphasis on research in aging and specifically on enhancing longevity and eliminating diseases of old age. However, there is a dearth of research focused on improving the emotional, social, and physical well-being of older adults. 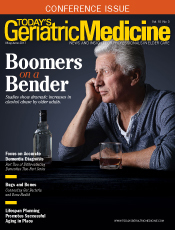 This issue is relevant not only to elders but also to their caregivers and health care providers. To fully grasp the nuances of aging, our empirical efforts must expand beyond the lifespan. As the field of aging grows, interventions to enhance the well-being of older adults warrant closer attention. As the population of older adults increases in size, there is a growing demand for health care providers to manage their needs and monitor their health. At present, there is a major global shortage of geriatric care providers—an issue that is approaching crisis levels and is only going to grow. Innovations in technology may provide some solutions to this issue. For example, communication tools such as smartphones, sensors, and data management algorithms may allow physicians and health care staff to remotely monitor the health of older patients. Such devices have the potential to improve both access and quality of care available to older adults. In addition to such passive applications to monitor the physical health of older adults, technology also has the potential to be used more directly by elders in ways that may improve their psychological and emotional well-being. For example, computer-based technologies in elder-friendly formats can be relatively easily customized to meet an individual's needs. These technologies have the potential to help older adults communicate with relatives who live far away, thus improving social functioning. Older adults with limited mobility can leverage technologies to remotely conduct financial transactions or execute everyday tasks such as grocery shopping. One concern that is often raised focuses on the ability and interest of older adults in using these information and communication technologies (ICTs). Older adults, of course, do not use ICTs as commonly as younger individuals, but they do appear to use these devices in comparable ways (eg, to communicate, to access health care information, for entertainment).2 There is growing evidence that certain factors such as perceived advantages of technology use and design elements may influence whether or not older adults utilize new technologies.3 Thus, there appear to be promising targets for modifications that can improve technology adoption by older adults. The utilization of ICTs in geriatric care warrants close investigation into the feasibility, acceptance, and economic viability of these approaches. While demographic factors (eg, age, gender, and level of education) are often considered when determining the ease with which older adults use ICTs, the influence of other factors such as dementia, psychiatric illness, and caregiver availability on technology use is yet to be fully characterized. Novel technologies have the potential not only to improve access to care for patients with dementia but also to show promise as therapeutic tools.4 Their interventional utility may be particularly relevant in the management of behavioral symptoms such as agitation. Individuals with dementia often demonstrate behavioral symptoms such as agitation, aggression, and psychosis. These symptoms are associated with significant caregiver stress and frequent need for hospitalizations, as well as higher mortality. Better management of behavioral disturbances may not only help patient outcomes but also improve caregiver burden and reduce health care costs. Typically, antipsychotics and other pharmacological approaches have been used to manage behavioral symptoms in older adults with dementia. However, these medications add to the risk of polypharmacy, have a limited benefit, and may be associated with side effects such as stroke and mortality. Thus, there is a need for nonpharmacological interventions for behavioral management of older adults with psychiatric illness. Nonpharmacologic interventions (eg, individualized musical experiences, reminiscence, or art therapy) may be most effective in managing symptoms such as agitation if an individualized approach is implemented wherein a patient's unmet needs are identified and appropriately targeted. However, this can be time and resource intensive. There is growing evidence to suggest that technology may serve to enhance delivery of nonpharmacological interventions for agitation; however, this approach remains to be investigated in the context of reducing agitation in older adults with varying severity of dementia. To examine the feasibility, usefulness, and safety of tablet device use to manage behavioral symptoms, the authors conducted an open study in older inpatients with dementia and comorbid agitation. The researchers found that even patients with severe dementia were able to utilize the tablet devices, albeit with some guidance in the case of individuals with severe dementia. We also noted that individuals with severe dementia utilized the least complex applications (eg, music apps, picture-viewing apps) for the shortest duration of time. Based on staff ratings of agitation, patients with milder cognitive impairment appeared to experience greater benefit in their behavioral symptoms posttablet use compared with those with advanced cognitive impairment. As the penetrance of technology in geriatric care increases, there will be a growing need to develop resources for clinicians and caregivers regarding the use of these devices in an older population. This is also relevant in the context of applying these technologies in an interventional context. There is a need for guidelines for utilizing tablet devices and other novel technologies as effective caregiving tools, as well as for app developers working to serve the needs of older adults with a range of aging-related conditions including dementia and psychiatric illness. — Rujvi Kamat, PhD, is a neuropsychologist at the University of California, San Diego. Her clinical focus is on the care of older adults with comorbid dementia and psychiatric disorders. She conducts research in the neuropsychiatric sequelae of HIV infection as well as successful aging. — Ipsit Vahia, MD, is a geriatric psychiatrist, clinician, and researcher. He is the medical director of the geriatric psychiatry outpatient services at McLean Hospital in Belmont, Massachusetts. His research focuses on the use of technology and informatics in the assessment and management of older adults. 1. He W, Goodkind D, Kowal P. An aging world: 2015. International population reports. https://www.census.gov/content/dam/Census/library/publications/2016/demo/p95-16-1.pdf. Published March 2016. 2. Opalinski L. Older adults and the digital divide: assessing results of a web-based survey. J Technol Hum Serv. 2001;18(3-4):203-221. 3. Melenhorst AS, Rogers WA, Bouwhuis DG. Older adults' motivated choice for technological innovation: evidence for benefit-driven selectivity. Psychol Aging. 2006;21(1):190-195. 4. Loh PK, Donaldson M, Flicker L, Maher S, Goldswain P. Development of a telemedicine protocol for the diagnosis of Alzheimer's disease. J Telemed Telecare. 2007;13(2):90-94. 5. Cohen-Mansfield J, Marx MS, Dakheel-Ali M, Thein K. The use and utility of specific nonpharmacological interventions for behavioral symptoms in dementia: an exploratory study. Am J Geriatr Psychiatry. 2015;23(2):160-170.